Today in this Article we will discuss some Short Tricks to solve Verbs and its usage in English Language. It is very important part if you are preparing for IBPS, SSC, SBI, Other Banking Examinations. Follow the English notes given here as it must help you to build a strong foundation in this section. A verb is a word which states something about a person or a thing. Ex. He walks. I go. The Sun shines. In case of third person singular number, “s”/ “es” / “ies” must be added after the verb. Ex. Ram writes a letter, Sweta goes to school, Raghu flies kite in afternoon. Few verbs cannot be used in continuous form usually, but can be used in particular cases. These verbs are see, feel, agree, smell, notice, have, mind etc. Ex. The food smells good. She has an internet connection. “For” or “Since” along with the present perfect tense are used in case of the actions that began in past and still continuing up to the time or finished at that time. Ex. I have known him since 2000. Rashi has been suffering from fever for last three days. In case of some action that began in past and still continuing, the present perfect continuous tense is used. Ex. I have been the book since morning. Is case of two actions were performed in past, simple past tense must be used in both cases. Ex. When she opened the gate, the dogs came in. In case of first action was finished before the second action started, past perfect tense must be used in first action while simple past for the second. Ex. Rama’s mother had died before the doctor arrived. The question tag must be used in interrogative form after the negative sentences. Ex. Swati did not like Rahul, did she? One must use negative interrogative after positive statements. Ex. Let’s play a game, shall we? If the verb in principle clause is in past tense, the verbs in subordinate clause are in past tense. Ex. They told me that they have seen the man. If one subordinate clause expresses a universal truth, the past tense in main clause may be followed by the Present Tense. Ex. He said that the sun rises in East. In case of past tense in main clause, it may be followed by the tense after “than” in subordinate clause. Ex. They worked faster than we do. In case of conditional sentence, the simple past tense in if clause and present conditional tense in main clause are used to express the improbability in Present. Ex. If she were rich, she would buy a house. Past perfect tense must be used in if clause and perfect conditional tense in main clause to express the unfulfilled condition. Ex. If you had studied attentively, you would have passed in the examination. If any interrogative sentence starts with the auxiliary verbs, if/ whether must be used as the connective word in the indirect speech. Ex. He asked me if I was going there. In case of indirect speech when it begins with why or how, no other conjunction would be used as connective word. Ex. He asked me where I lived. There must not be any preposition after “told”. Ex. He told me that he had passed in examination. “Tell” must be used with object. Ex. He told me he had seen the movie. These are the action verbs which are used to express doable activities. A direct object does not follow the intransitive verbs. Ex. The man spoke harshly. The baby wept in hunger. These verbs have the direct objects that mean something or someone has received the action of the verb. Ex. The Newspaper was read by my grandfather. These verbs are known as the helping verbs. These are used with a main verb to show the tense of the verb, to make a negative or question. These are called Helping Verbs also. Ex. Samita is writing a letter to her friend. / Do you know the password? / He did not mention his name in the paper. These verbs express the state of state rather than an action. These verbs relate to the emotion, thoughts, relationships, states of being, senses and measurements. Ex. Suniti feels rotten today. She has a bad Cold. 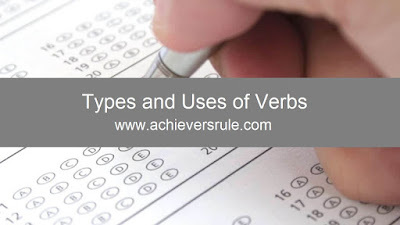 These verbs are the Auxiliary Verbs which are used to express possibilities, permissions, abilities and obligations. Ex. Can/ Could/ be, May/ Might, Shall/ Should, Must/ Have to, Will/ Would. I can do this. You should do this. He would wear the dress. These are the combinations of words which are used together to mean something different from the original verb. Ex. We have less time to get on the plane. What will he think up next? These verbs do not take on the regular patterns of spelling of simple past and past participle forms. Ex. Go (Went, gone), Get (got, gotten), say (said), Think (thought), Make (made), Take (took, taken), Come (Came, Come), Know (Knew, Known) etc. Generally will is used with He/ She and you and shall is used with I. Will is used with I in deterministic cases. Ex. I will do this for you. Would is used for the past of will in case of narration or in case of request. Ex. Would you please give a pen. Should in used for advice. Ex. You should always speak the truth. Could is the past of Can. It is also used in case of a formal request. Ex. Could I meet the Director? It is used for compulsion. Ex. He must solve the question. It is used in case of moral duties. Ex. You ought to respect the elders. It is used in case of practice. Ex. He used to do Yoga in every morning.